But you see, 199 years ago this week, the infamous 29th Bulletin announced to France that the Grande Armee had been lost amidst the winter snows of the Russian plains, that few of them would be returning from the Russian wilderness…though of course, Napoleon lied about this as he did about everything else. And this was shortly followed by the reappearance of Napoleon in Paris. Alone. With only his secretary, Caulaincourt at his side. And no army. Not any. For nearly a year, Napoleon had been planning the invasion of Russia–ever since Russia had quietly reopened her ports to British ships and trade in 1811. (This really pissed him off.) 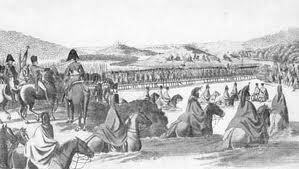 And during that time he had amassed one of the largest land armies ever seen–the Grande Armee–the Great Army. Nor does this take into account the hordes of accompanying civilians. Napoleon’s household alone contained some 100 to 150 civilians–butchers, cooks, vintners, bakers, saddlers, blacksmiths, laundresses…And many of Napoleon’s generals also had large ‘households’ which accompanied them into occupied territory. Then there are the thousands of soldiers who brought their wives and children; there are the bakers, saddlers, blacksmiths, brandy-sellers, and camp followers…some 50,000 people, is the conservative estimate of the number of civilians. But already there were problems. Europe was in the grip of a period of exceedingly cold winters which lasted well beyond their usual allotted time. So, across Prussia and Poland, in those stretches of land where Napoleon had his armies camped in readiness for his arrival, the harvest–that harvest which was meant to feed this vast army of men and horses–wasn’t ripe. It was still too green. So the horses fed upon it and died, in their thousands, of colic. And the troops went hungry–they starved or became ill with dysentery. They suffered horribly from dehydration too. And died. Poland was frighteningly poor. Even by the low standards of the day. The French occupation of their country made paupers of most Poles. Literally. So despite what Napoleon said in that official Bulletin to which I referred earlier, that all the problems were due to horrible weather on the homeward journey (and that’s still the version of events many people believe), the fact is a third to one half of his army was dead before Napoleon crossed the River Niemen into Russian territory on the 28th June 1812. And that’s not counting deserters…(because the French didn’t count deserters. They didn’t admit that anyone deserted.) There were probably some 30,000 deserters roaming the countryside and pillaging by this point. However, the Russians had their own game plan. And it didn’t look anything like his. Instead of giving battle, they just kept withdrawing. Day after day, week after week. Across a Russian landscape that had been stripped bare–scorched earth. The weather wasn’t great either. Daytime temperatures were up around 37 degrees Celsius. And there was a massive storm, one which turned the roads to bog, so that men and horses drowned. Or froze to death when the bogs froze at night. Some 10,000 to 35,000 horses died in this agony. So across this Russian landscape, with starvation stalking his men and horses, Napoleon pursued the retreating Russian troops–determined to gain a decisive victory, bewildered that no emissary from Alexander arrived to beg for peace on any terms. The Russians under General Mikhail Kutuzov finally gave battle at a place called Borodino, not far from Moscow, on the 7th September 1812. I’ve blogged about this elsewhere, so I shan’t now go into details. But the number of casualties is staggering–even for the Napoleonic era. The Russians may have had more men–at least on paper–but 31,000 of them were militiamen and armed only with pikes and axes. So probably the Russians had about 125,000 troops. And they faced a French army of perhaps 130,000. By the close of day, the French had lost some 35,000 men; and the Russians somewhere between 45,000 and 50,000–with much of their officer corps wiped out. Both sides declared it a victory; Kutuzov ordered a retreat and by the 14th of September, the Russian army was passing through Moscow–joining a mass exodus of Muscovites–at least two-thirds of the city’s population. Again, Napoleon misread the Russians. He firmly that if he occupied their beloved Moscow, the Russians would come begging for peace. 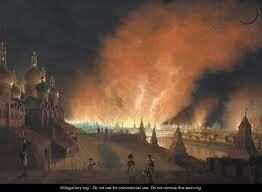 Napoleon entered Moscow on the 15 September and took up his headquarters in the evacuated Kremlin. But just as he was getting comfortable, fires were started throughout the city upon the orders of the Governor of Moscow, Rostopchin. Over the next six days, the fires raged, destroying some three-quarters of the city. The starving French soldiers looted and pillaged whatever was left. The wounded were left in the streets to die. And Tsar Alexander did not come begging for peace either, though every day patrols brought in scores of French foragers and marauders and deserters–so the Russians knew that the French were lacking even basic food and fodder. Hence on the 17th October, Napoleon, accompanied by all that was left of his armed troops–probably now some 95,000 men, or less–quitted Moscow for the long march back to Paris. Joining them were some 40,000-50,000 civilians–and as the French troops had ransacked Moscow for treasures which they intended to bring home and sell in order to make their fortunes–some 15,000 to 40,000 carts, carriages, and wagons piled high with food and luggage and booty. Within a day, these treasures were being abandoned along the roadside…On the 22nd October, fierce rainstorms turned the roads into a sea of mud. Nor was the fight against the Russians finished. Straggling across this barren landscape of mud, their morale in tatters like their clothes, the remnants of the French army were harassed by the small hordes of Cossacks on their fast ponies–those left behind would be captured and taken back to Russian villages where they would be tortured to death. And then, on the night of 6th November, the temperatures plunged and men and horses froze to death in what was to be the beginning of the end for the survivors of this disastrous campaign. The freezing temperatures also meant that there was no water–either for the horses or the men–without water, the remaining horses died. And it would only grow colder. There were more battles to come too as the now rested and remounted Russian troops mounted assaults on the retreating French, including the terrible assault as the French sought to cross the Berezina. During those three days at the end of November, the French lost a further 25,000, though perhaps up to 10,000 of those were civilian stragglers–though, mind you, this isn’t mentioned in the 29th Bulletin either. Napoleon himself, determined to shore up support and save his throne, abandoned the few remaining troops on the evening of the 5th December and set off for Paris, alone with Caulaincourt, his secretary. The 29th Bulletin was published in Paris on the 16th December and everywhere, the news it contained was met with shock and stunned grief. Never, not once, before had Napoleon admitted anything like defeat or even setback–he’d even had Trafalgar announced as a French victory. The scale was beyond anything anyone could imagine. Of the possible 450,000 troops, not to mention horses and civilians, who went into Russia, no more than 50,000 came out. Probably less than that. And less than a quarter of those lost died in battle. Of the nearly 30,000 Italians who had been part of the Grande Armee, only 3% survived. Across Europe, in all those countries controlled by France, the losses were the same and grievous to be borne. I have deliberately excluded the harrowing details of these events from this brief account, the descriptions of battles, the geography even. 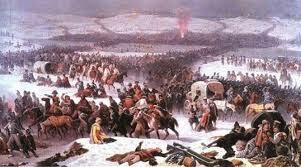 For a full account, I cannot recommend strongly enough Adam Zamoyski’s 1812: Napoleon’s Fatal March on Moscow. Also, utterly fascinating as it gives the Russian account of the situation is Dominic Lieven’s superlative Russia Against Napoleon, the Battle for Europe, 1807-1814. And now, as I think yet again on all those lives squandered and all those families, those wives, daughters and sweethearts left newsless and comfortless…Well, it’s time for a cup of tea at least, I think. Don’t you? This entry was posted in History, Napoleon and tagged 1812, Continental Blockade, History, Invasion of Russia, Military history, Napoleon, Napoleonic history. Dreadful. How can a man be so cruel and so power-hungry as to do that? And then have the gall to ask for more troops? I left out the truly dreadful stuff! I think one can only, by this point, think of Napoleon as a meglomaniac. He’s certainly not rational. He has lost all sense of anything beyond his own pursuit of glory and power. He always did have a ‘problem’ with the human cost–he it was who said, “I have an income of 85,000 men a year.” And they, to him, were expendable. Carelessness indeed, and not in the absent-minded sort of way. There’s a quote in Zamoyski’s book where a French officer describes being able to see the horses’ entrails through open wounds in their skin – before the retreat even began. You can’t really imagine it. Superb post. Fascinating stuff. Curious that prior to their invasions, neither Napoleon nor Hitler factored in the effect of the Russian’s greatest commander: General Winter. Both started too late: June 24 for Napoleon and June 22 for Hitler. Both gave themselves too little time to wrap things up before General Winter strode onto the stage in his resplendent white uniform. Well, yes, we do tend to believe the General Winter story. It’s so dramatic and credible. But Zamoyski gained access to more than the usual French sources, he had full access to the Polish sources, the Lithuanian and Ukrainian and Russian sources as well. And that’s where all the accounts of the death by starvation, dysentary and dehydration come from–and that was at least half of the total troops–dead without firing a shot or even crossing the border into Russia! Hence, before they departed from Moscow to march into the icy jaws of General Winter, Napoleon had already lost 3/4 of his army. Lieven’s findings (again Russian and German sources) have only backed this up further, as he understands a horse-drawn society better than Zamoyski, so his explanations of what the loss of those 450,000 horses meant to an army or a nation are eye-opening. And, whilst we may judge that they started too late, they could not have started any sooner. Indeed, because of the lateness of the harvest in 1812, not only were Napoleon’s men and horses doomed to starvation, the local populations were likewise reduced to privation. Napoleon’s men, angry that the harvest wasn’t ready, rode hell-for-leather through the ripening corn so that it was trampled and of no use to anyone. To feed their horses, they stole the thatching from off the locals’ roofs. You’re absolutely right, of course. Was just engaging in a bit of rhetorical flourish — can’t help myself sometimes! Anyway, thoroughly enjoyed this. Thanks. Very good summary of the cost of the campaign in human lives. The suffering of the soldiers is often overlooked when we look only at the strategy of the campaign. The decisions that are made by the leaders have real consequences for those who must carry them out. My blog follows the trials and tribulations of the soldiers during the disastrous Russian campaign. I use eyewitness accounts to detail what it was like to be a soldier in Russia in 1812. I’ve read several of the French survivors’ memoirs from the 1812 campaign. Not all of them are pro-Napoleon by any means, but there is certainly an element of that in many of them. What has made Zamoyski’s and Lieven’s work so outstanding that it has left all previous works on the subject in the shade is that both men accessed the Russian, Polish and Ukrainian eye-witness and court accounts of the period–which give one a much more accurate and even-handed view. Both verify the accounts of the atrocities of which the French complained with Russians accounts, for example, which confirm that the French weren’t making up what they’d endured at the hands of the Russian peasants–if anything, they were playing it down. I wouldn’t now take a step in writing about this period without consulting the pair of them. Also, because of the thaw of relations between the West and Russia and Ukraine, there has been a certain amount of archaeological investigation of battlefields and mass graves dating to the invasion. And for example, the forensic historians analysing the skulls found in the mass graves from Smolensk–among other things–that 80% of those French troops buried there were suffering from tertiary syphilis. This, again, has forced us to reconsider what we thought we knew about the Grande Armee and Napoleon’s alleged excellent treatment of his troops and the alleged excellence of medical care available to them. I used Zamoyski’s book quite a bit when I was working on my novel. In my blog, I’ve concentrated on the daily experience of the soldier as much as possible although I do have incidents described by officers. I agree that the eyewitness accounts are mostly pro-Napoleon, but I leave most of that out and concentrate on what it was like to survive day after day with little food in the relentless cold whether a supporter of Napoleon or not. Another book I found fascinating was Illustrious Dead: The Terrifying Story of how Typhus Killed Napoleon’s Army by Stephan Talty. The massed troops and lack of knowledge about how typhus is spread led to a wasting of the army without any combat taking place. Hey do you know of any field Marshals that withdrew their support for Napoleon immediately after the Russian Campaign? Support within the army remained strong for Napoleon, even after the disaster of the Russian campaign. And that is true of les Marechaux. 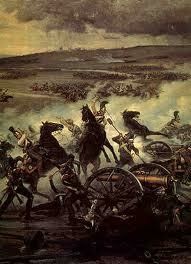 No Marechaux had died on that campaign, although at Borodino, the French had lost twelve generals. It is probably a statement of just how thoroughly France was a military state, with a military dictator at its head that the army continued to follow Napoleon even after the Russian campaign. I should also add that in Napoleonic France there was no such thing as public opinion. It didn’t exist. There was no such thing as a free press–the two newspapers were state-controlled and the one, le Moniteur, was cited in this old French saying, “To lie like le Moniteur…” Dissent was stifled at all cost. In early 1812, both Fouche, Napoleon’s Minister of Secret Police, and Talleyrand, his Foreign Minister, had strongly opposed the proposed Russian invasion and had both been sacked from their positions. The new Minister of Police, Savary, had spend the months prior to the invasion rounding up dissidents and chucking them in prison. 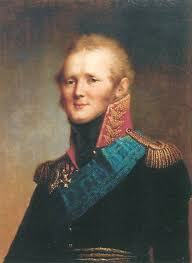 He was known in France as Napoleon’s Fanatic for his fierce and even murderous devotion to the Emperor. It is available on my family-site in German and Hungarian. Unluckily I found no time to translate it into English. I would rather like to illustrate the article with some picture showing the ruin of the “Grande Armée”. For drawings or paintings of the ruinous retreat of winter 1812, check out those paintings by Faber du Faur, an eye-witness as well as an artist. Thanks for the suggestion, but I am not certain, if the copies on the net are copyrighted or not. I will have a look anyway.